November is the beginning of the sea turtle stranding season on Cape Cod, and this weekend nine critically endangered Kemp’s ridley sea turtles washed up on Outer Cape beaches, almost all in Eastham. The 4-9-pound black-shelled turtles were rescued by the dedicated staff and volunteers from the Massachusetts Audubon Sanctuary at Wellfleet Bay. 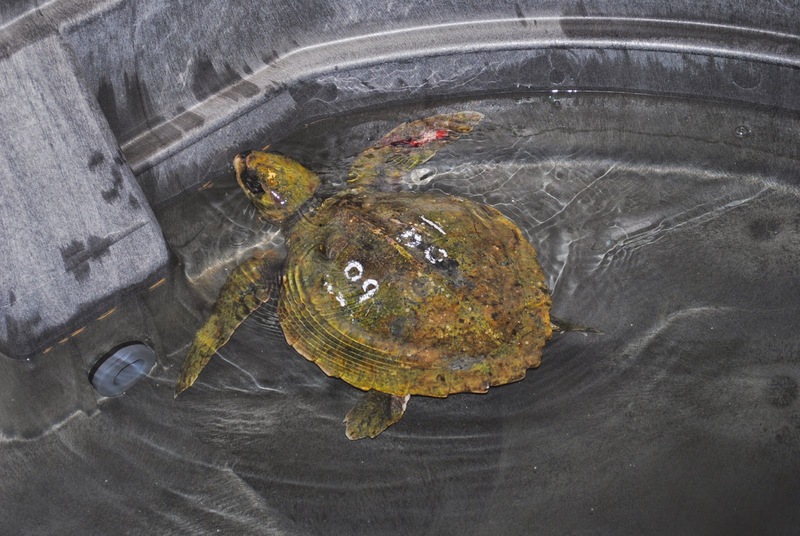 The turtles were then transported to the New England’s Aquarium’s sea turtle hospital in Quincy, MA. See more pictures of these first turtles to arrive at the sea turtle hospital on the Rescue Blog! An endangered Kemp’s ridley sea turtle covered in algae is evaluated at in-take at the New England Aquarium’s sea turtle hospital in Quincy, MA. 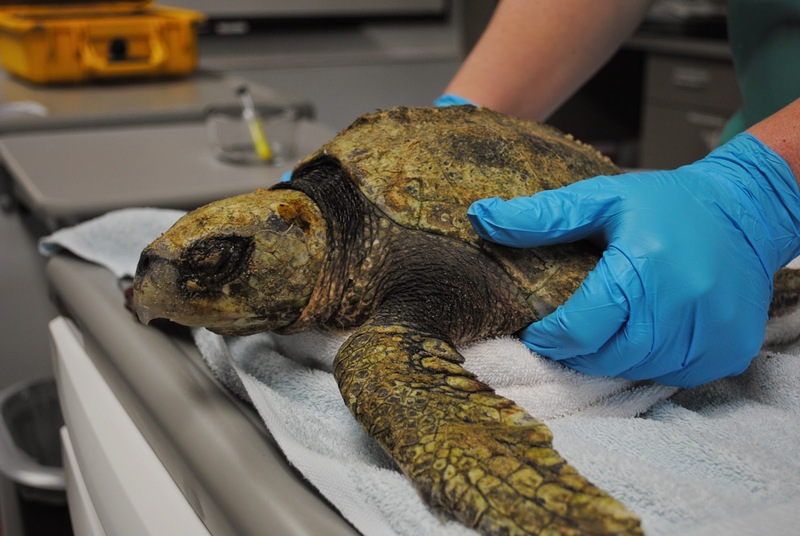 The turtle stranded in Eastham on Cape Cod over the weekend due to prolonged hypothermia. Most of the lethargic turtles were covered with accumulated algae from lack of activity due to low body temperatures in the mid-50’s. Since sea turtle are reptiles and cold-blooded, they assume the water temperature around them. Their preferred body temperature is in the 70’s, and Aquarium biologists and veterinarians will slowly re-warm the turtles about 5 degrees per day over the next three days. Once re-warmed, many of the turtles will have other medical problems due to the slow chilling and minimal eating over the last several weeks. Malnutrition, pneumonia, blood disorders and orthopedic issues are all common problems that require prolonged rehab of anywhere from 3 to 10 months. 85 to 90% of the live rescued turtle survive and are released back into the wild, usually in the warm waters off of Florida or Georgia over the winter. A slowly re-warming sea turtle that stranded on Cape Cod over the weekend due to hypothermia gets a little physical therapy with a supervised swim at New England Aquarium’s sea turtle hospital in Quincy. Kemp’s ridleys are the most endangered sea turtle in the world. As juveniles, they migrate annually to the waters off of Cape Cod to feed on crabs. Many of the young animals end up in Cape Cod Bay on the north side of this huge, backward L shaped peninsula. Many of the young animals are unable to figure out the tricky navigation out of the bay and slowly become hypothermic as sea temperatures slowly decline during the autumn. Wave activity churned up by northwest winds washes the inert turtles ashore. In an average year, 90 to 100 sea turtles of three different species will strand on Cape Cod and the Islands due to cold stunning. The record was 242 in 2012. So far, this year 11 Kemp’s ridleys have stranded with the first arriving from Martha’s Vineyard November 3. The season could last until mid-December depending on weather. Over 20 years, the New England Aquarium and Mass Audubon at Wellfleet Bay have rescued, rehabilitated and released more than 1000 endangered and threatened sea turtles.